Have just discovered an autobiography written by C.A. Gibbs who was born in 1885 in MO. 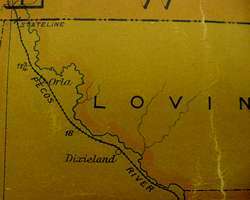 He writes about Dixieland, TX in about 1912. "Mr. Oates and Roy had been away 3 or 4 days. They had missed some cattle, some branded (lazy Y) and some branded W so they had been checking with all the ranchers over west along the river. When they returned Roy said that they had stayed one night at the Jeans ranch. Jeans had been operating a ranch for years. It was located in east of Dixieland and Roy and Mrs. Oates knew the whole family as they used to get their supplies and mail at Dixieland when Mrs. Oates was postmaster there. The Jeans family were quite a family and had a large ranch house. There was Mr. and Mrs. Jeans, 3 daughters and one son. The oldest daughter, Annie was about 28 and had been teaching school for years in the Carlsbad City school. Next was Agnes, about 20. The youngest daughter was about 18 and the boy about 16. Annie was quite a practical person. She had invested her money in cattle and had a nice herd. She and her father were sorta pardners and Annie was a great entertainer. She was always giving house parties and dances." I have a post card addressed to "Miss Celinda Newton" Dixieland, Texas. 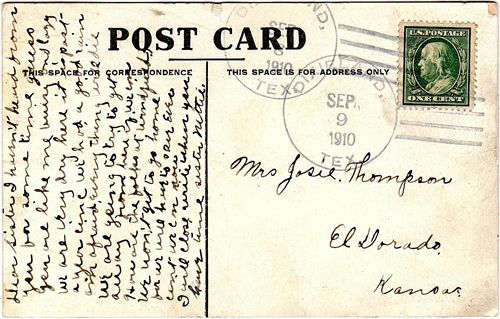 postmarked 1908. Ms. Newton was a school teacher in Porterville, Tx . It appears that they must have used this mailing address before there was one closer.